Our inventory changes daily and we can accommodate most widths, lengths, ply’s, styles and materials. We will trim and divide roll lengths to best fit your needs. We also supply custom widths from 12" up to 84", thickness from 1/8" up to 1½". 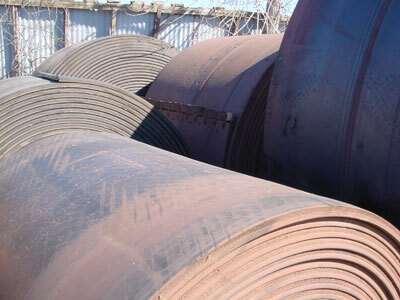 We also sell scrap rubber belting at affordable prices. This scrap belting is great for rubber floor matting, cow mats, horse mats, trailer beds, snow plow deflectors and much more. Just tell us the size and we'll cut it for you. Call Kevin today at 262-227-8175 with your requirements. We can cut any belt to any size, length or shape using our high quality conveyor belting tools. Atlas Belting strives to reduce the amount of material put into landfills. We are committed to conducting business in a manner that manages and solves environmental issues responsibly.